And crowned him with a crown of glory O Word. This newly shining star lived during the reign of Theophilos the iconoclast (829-842), and was born and raised in Constantinople. His parents were Zacharias and Theophano, who were adorned with every virtue and prudence, and they lived in the district of Constantinople known as Zeugma, not far from the Church of the divine Protomartyr and Archdeacon Stephen. When the mother was pregnant with this Saint, she kept away from and did not eat fatty foods (among which is meat), but only plenty of bread and water and vegetables, until she gave birth to him. When the Saint was born - O the miracle! - there appeared on his chest a shining and most beautiful cross. This was a great sign of the crucifixion and detachment that the Saint was to have in regard to worldly things. After he was wrapped in swaddling clothes, it was necessary for him to be breastfed according to the laws of nature. But this Saint appeared to be higher than the laws of nature. When his mother ate food that was more than necessary and she was satisfied, he wished not to be breastfed by her. Many times he remained without being breastfed two or three days, as long as his mother was satisfied. Therefore it was necessary for his mother to exercise self-control, in order to feed her son who was full of grace. This brought consternation and affliction to the friends and relatives of the child. Then the Saint was baptized, and unwrapped from his swaddling clothes. He was cut off from the milk and soon grew, then he was sent to a tutor in order to learn sacred letters. These he eagerly learned, and was subject to his parents. When the God-hater Theophilos died, immediately by divine election Saint Methodios was elevated to the Patriarchal Throne of Constantinople. 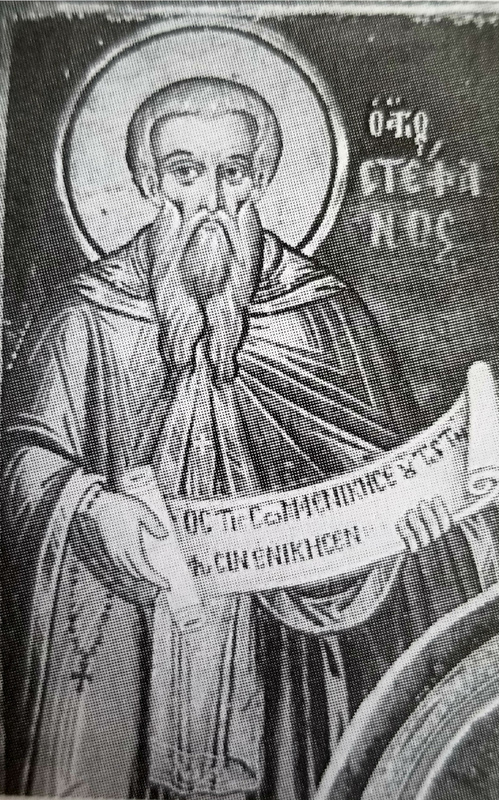 At this time the honorable Zacharias, father of Saint Stephen, was ordained Presbyter and numbered among the clergy of the Great Church. At around that time his son the divine Stephen cut the hair of his head, and also became a cleric of the Church, namely a Reader. And as often as his father went to church, so also was he followed by the divine Stephen. When the Saint was eighteen years old, he shut himself in the prayer house of the Holy Foremost Apostle Peter, and he lived there always, praying, satisfied merely with vegetables as food. While the Venerable one was thus conducting himself, Peter the Apostle of the Lord appeared to him, and said: "Peace be with you child. Good is this the beginning of your purpose. May the Lord strengthen you." Then after three years, the divine Hieromartyr Antipas appeared to him [it seems he had moved from the prayer house of the Apostle Peter to that of the Hieromartyr Antipas at this time], saying: "Peace be with you child. Chant to me, and I will not abandon you." Hence from that time the Saint gave himself over to more prayer and fasting, eating once or twice a week from the habitual foods, which was cabbage and nothing else. In this way the renowned one cleansed himself, and was made worthy to be ordained a Presbyter, and he worked many miracles. In the twelfth year of the reign of the pious emperor Basil the Macedonian, when the Saint was forty years old, in the year 879, a great earthquake took place in Constantinople. From this every part of the Church of Saint Antipas was torn apart. The Venerable one therefore left there and went to a pit which resembled a tomb. There he lived for twelve years, with a plank of wood under him, covered over with sackcloth, and on this he slept. Due to the moisture of that place, the hairs of his head and beard fell off. He also lost his teeth, and almost his entire body became paralyzed. He was therefore forced to come out of the pit completely deadened. Then he was dressed in the divine and angelic schema of the monks, and showed himself to be even more super human in his asceticism. When he would liturgize in the monasteries on the despotic feasts, after the dismissal of the liturgy he would take a dry fig, then wash out his mouth with a little water, and with this alone was the thrice-blessed one satisfied. With such labors and rough struggles did our Father Stephen the heavenly-citizen pass his days for an entire fifty-five years. When he was around seventy-three years of age, he died, delivering his soul into the hands of God.